Not everyone has the chance or even the means to get to a gym. As a result, millions of people are unable to meet their weekly exercise goals. Fortunately, you have a golden opportunity to get fit at home thanks to the impressive array of cardio machines on the market. Manufacturers have now designed cardio machines for home use, and few products are more popular than the recumbent bike. 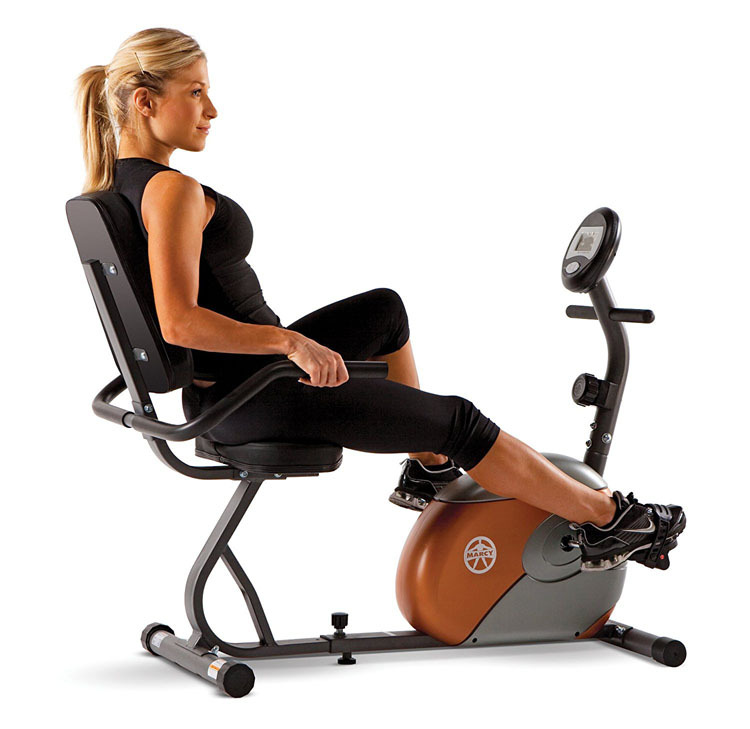 A recumbent bike is a piece of fitness equipment that features back support so you can recline as you cycle. When you adopt this position, it is possible to exercise for longer than on an upright bike because your back and buttocks are supported. This means your weight is distributed over a larger surface area and reduces possible strain on your lower back. In most cases, the resistance provided by the bike is magnetic and applied by a flywheel as is the case with regular indoor bikes. The flywheel provides momentum and makes you feel as if you are pedaling on a real bicycle outside. Regardless of whether you pedal quickly or slowly, you work your glutes, thighs, and calves among other leg muscles. You even get an ab workout in the bargain as you need to keep the abdominal muscles tight when cycling. It is a very popular piece of equipment commercial gyms, and now, you have the chance to purchase one for your home. Why Do I Need a Recumbent Exercise Bike? If a lack of comfort is one of the obstacles preventing you from exercising regularly, a recumbent bike is a fantastic solution. Not only does it keep your body in a stable and relaxed position, but some studies also suggest it works the leg muscles more effectively than its upright equivalent. You will burn just as many calories as you do with an upright bike but in a manner that makes you more likely to return again and again. Since the recumbent bike will be staring at you day after day, it is easier to motivate yourself to hop on for a good 20-30 minute session. You can take your fitness to the next level and if you find the pedaling process a little tedious why not position it in front of the TV or listen to music? Let your legs do the work while your mind switches off for a while. It is even an effective warm-up method if you plan to perform a resistance workout at home. 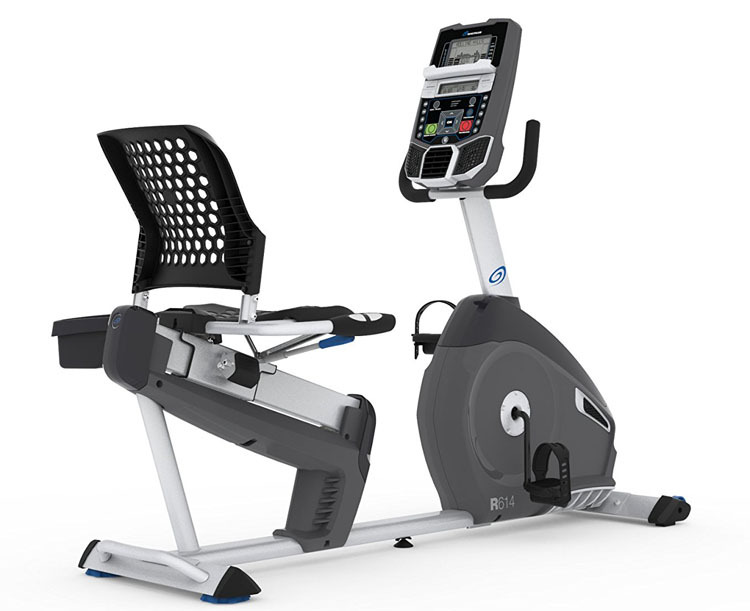 The Exerpeutic 900XL is arguably the best low-cost recumbent bike on the market. At its low price point, you shouldn’t expect it to be equipped with hi-tech gadgets, and it isn’t, barring the heart rate monitor. It is suitable for a wide variety of body types and features a strengthened frame capable of supporting up to 300 pounds. It is possible to adjust the distance between the seat and pedals by sliding the seat along the rail. It works best for users between 5ft 3ins, and 6ft 3ins tall so smaller or larger individuals may not find this bike comfortable. While there is some level of assembly required, it is relatively simple, and even those with moderate DIY skills will complete the task in a short period of time. It is surprisingly quiet when in use and offers a total of 8 resistance levels. While other low-cost models offer little or no extras, the Exerpeutic 900XL contains an LCD that allows you to track time, distance, calories, speed and your heart rate. There are also transport wheels to let you move the bike easily when required. The wheels are handy additions because the bike weighs 63 pounds. As a result, it is a sturdy piece of equipment that comes with a limited 3-year manufacturer’s warranty. This is a more expensive option but it unquestionably a value for money bike. It is definitely a notch above entry-level options because it has a total of 22 workout options and 20 resistance levels. The workout options include 8 heart rate programs, 9 profile programs, 2 custom programs, 2 fitness tests and the obligatory ‘quick start’ option. As a result, you’ll never get bored because the Schwinn 230 continues to challenge you. It is effectively a cheaper version of the 270 model, yet it only has 5 fewer resistance levels and 7 fewer workout programs. The only other major differences are the lack of Bluetooth capability and the heart rate chest strap monitor. Other than that, there is little to choose between them because with the 230, you still have the connectivity of mobile devices and you are allowed to access Schwinn Connect. In our opinion, there is no need to spend an extra couple of hundred dollars unless you desperately want Bluetooth connectivity. Other features include a large dual-window LCD, USB Port, speakers, a goal tracking and data export facility and the ability to display 13 different readouts. We really like the vented and contoured seat with the back support because it is so comfortable that you’re not willing to get off the bike prematurely. It weighs 81 pounds when fully assembled so you should put it together in the same place that you are using it. The frame is durable, and the bike can hold a maximum of 300 pounds. We have no hesitation in recommending the Schwinn 230 if you want a high-quality recumbent bike in the intermediate price range. The Diamondback Fitness 510SR is the gold standard of recumbent bikes. While it is rather costly, it is by no means outrageous as there are more expensive options that lack the 510SR’s class. This particular model has received rewards from consumer magazines, and it is easy to see why. It includes a whopping 16 resistance levels and 20 workout programs including hill climb, interval, heart rate, fat burn and strength. The LCD is clear and easy to read because it is well positioned. You can track your performance by analyzing the data on offer which includes RPM, watts, distance, calories, speed, time and heart rate. The quick-set buttons make it easy to adjust resistance as you pedal and you don’t even know the bike is in motion because it makes hardly any noise. The backrest is ventilated to improve air flow and stop you overheating while the base of the seat is sculpted for added comfort. Since the seat’s base slides backward and forwards, this bike is comfortable for very tall or short riders. The 501SR has an extremely heavy and stable base but beware; the bike weighs 125 pounds when fully assembled. It has a maximum capacity of 300 pounds, a frictionless braking system, a lifetime warranty on the brakes and frame and a 3-year warranty on parts & electronics. 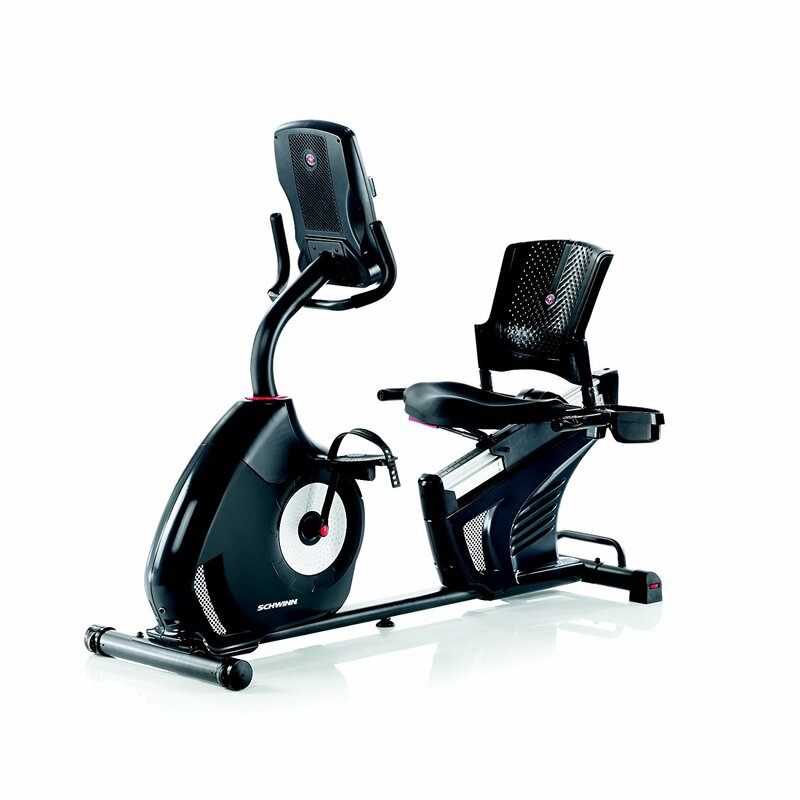 The 501SR is quiet simply a wonderful recumbent bike and one of the very best on the market. It is a mistake to assume that recumbent bikes are all the same. You’ll find that models vary regarding features and computer display so do some research and find the best one for your needs. As you’ll presumably be riding the bike for long periods of time, you need a brand capable of easily supporting your weight. The last thing you want is a bike that rocks from side to side! There are leg stabilizers on the market to ensure the bike stays steady. It is worth searching for bikes with seats that balance the weight of the user. Recumbent bikes with a heavy base are your best bet, and we also like models with an adjustable arm rest or back. The seat must have enough padding and support or else riding the bike will become an uncomfortable experience you’ll want to avoid. Bikes with easy to hold grips and adjustable foot pedals also enhance usability. The top brands tend to have solid and reliable brakes and possess a heavy base to keep the bike grounded. Look for bikes with a solid steel frame capable of holding 300+ pounds. Hi-tech brands tend to feature computers that display a huge array of information. You can use this data to help track your workouts and determine whether or not you’re making progress. Displayed data includes calories burned, distance pedaled and time spent on the bike. Models on the higher end of the price scale even allow you to download workout data on apps such a MyFitnessPal. Use this feature to have easy access to your training log. If you’re going to spend money on a recumbent bike, look for a model that offers various resistance settings and workout programs. There should be different levels of resistance and programs that challenge you. Also, you should be able to change levels easily while pedaling. 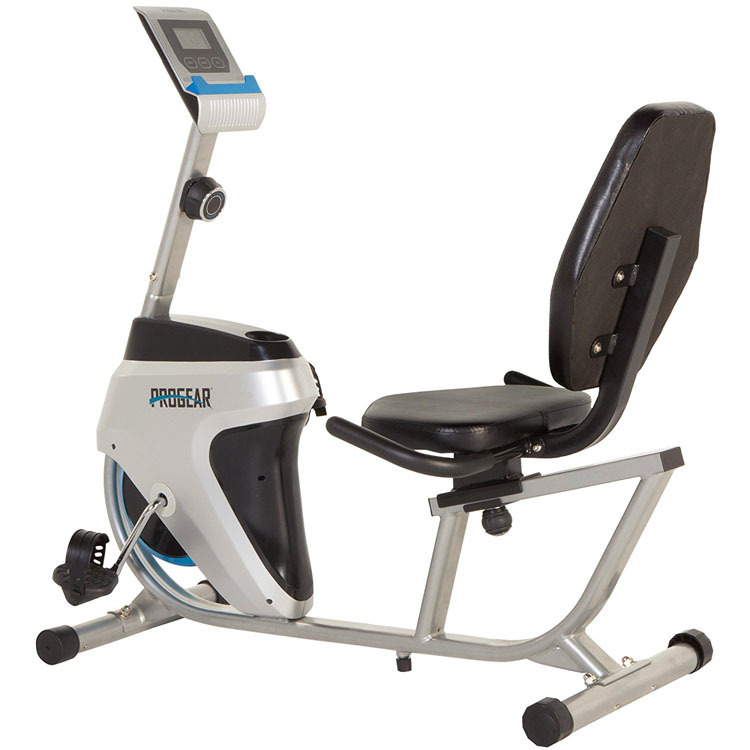 You don’t want to purchase a recumbent bike only to find that the set reclined position is uncomfortable. Top models allow you to adjust the back and the seat. Although it depends on your current weight and the resistance level you pedal at, it is possible to burn hundreds of calories an hour. You also increase your overall metabolism, so you burn even more calories at rest; excellent news for those hoping to build muscle. Achieving a reasonable level of fitness doesn’t necessarily mean pounding your joints or pushing yourself to the absolute limit. In reality, fitness comes from consistent and frequent exercise at a level that is challenging but not exhausting. To that end, recumbent bikes are perfect workout tools. Many forms of cardio exercise involve a sharp, downward thrust on the legs which results in excess strain on the knees. Over time, pounding the pavement, treadmill or running track causes you pain. When you exercise on a recumbent bike, you can recline into a comfortable position and reduce the strain on your hips and back. A recumbent bike is perfect for newcomers to the world of exercise or those who are returning after a long lay-off. You get to choose your rate of exertion and can steadily build up over time. Even people with neurological conditions can use it because it allows for a safe workout with minimal impact on the body. For some people, the idea of sitting on a stationary bike for a set period is akin to medieval torture. Indeed, experienced athletes will not be thrilled to sit down for an hour even if it means exercising their legs. This level of boredom may prevent you from reaching your full potential. Reduce the monotony by listening to music or watching television. If you can read a book or magazine while pedaling, it means you’re not going fast enough! While you can find low-cost recumbent bikes, they tend to be more expensive than their upright rivals. This is the price you pay for added comfort. Again, this depends on the model you choose, but recumbent bikes always take up more space than upright bikes. If you have limited space, you might also find storage to be a problem. The key to long-term fitness lies in finding an exercise that you will stick with for a long time. If you dread the idea of exercise or else you simply don’t have time to get to the gym, a recumbent bike might be the answer. It provides you with a low-impact cardiovascular workout ideal for someone with knee, back or joint problems. The fact that you can sit back, relax and watch TV while pedaling is a big plus to those who would rather do just about anything other than exercise. You can cycle at any time day or night, in the rain or the cold because you don’t have to leave home.